Translations: Bates International Poetry Festival 2011 documents this creative event featuring eight poets from around the world: Polina Barskova (Russia), Rhea Côté Robbins and Robert Farnsworth (United States), Francisca López (Spain), Naomi Otsubo (Japan), Danny Plourde (Canada), Carmen Elisabeth Puchianu (Romania), and Miguel Ángel Zapata (Peru). These poets spent five days performing their poetry in their native language and interacting with students and faculty on translations of their work. Contained in this volume are the original poems and the translations that came from this collaboration. 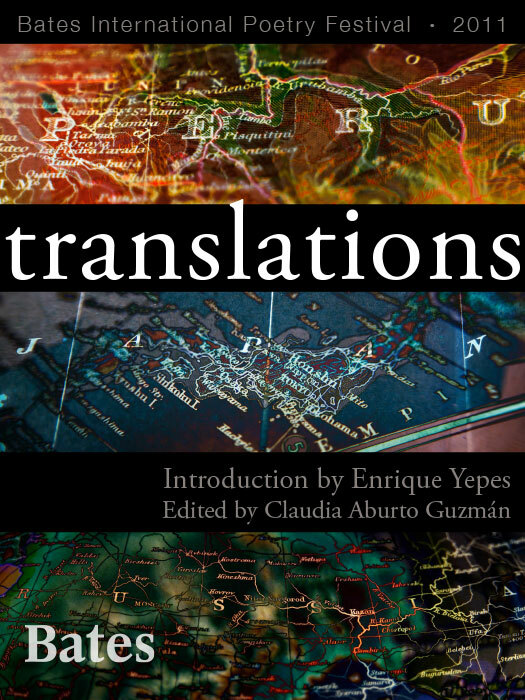 Essays on the meaning of festivals, insights into translations, translation in pedagogy, and reflections on multilingualism from Enrique Yepes, Jane Costlow, Sarah Strong, Claudia Aburto Guzmán, Laura Balladur, Francisca López, and Raluca Cernahoschi round out this fascinating volume.